Nepenthes burbidgeae was one of the first Nepenthes I bought. It's one of the classic highlanders from Borneo. 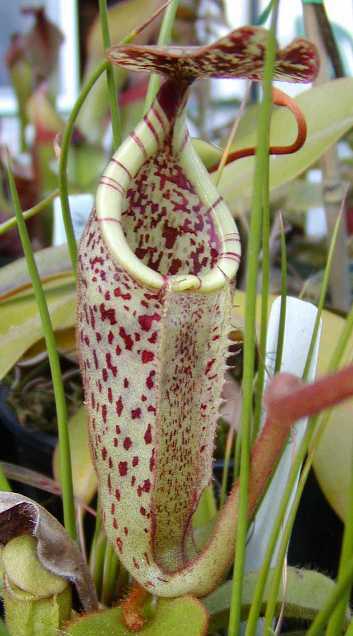 The pitchers have a streaked peristome and spotting on the pitcher itself. 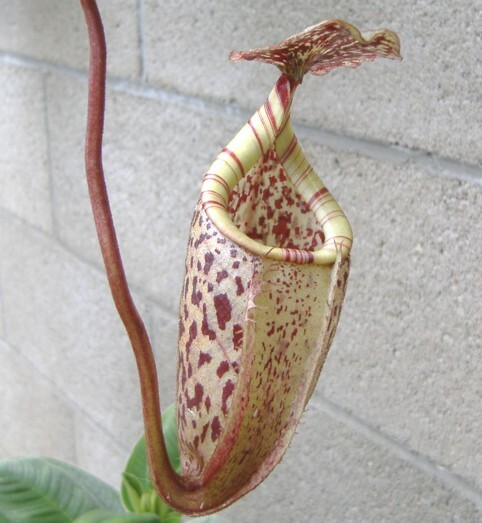 I've seen a photo (I believe at Exotica Plants) with a person's fist inside the pitcher to attest how large they get. It is a relatively slow growing species that seems to go through growth spurts. They seem to grow very slowly for a year or two. Then all of a sudden they start growing much quicker than normal. I don't know if that is a common occurence with this species but it happened to me. Now larger specimens up to 10" are available at relatively reasonable prices. I grow this species in hanging pots and they can take full sun but seem to appreciate some shading to filtered sunlight. When California had record low temperatures around 28 F in January of 2007, all of my N. burbidgeaes were decimated. They went into shock and the leaves blackened. I lost one plant and my best clone's growing tip turned black. Now it is growing out again but will take years to reestablish itself. I was able to get another large N. burbidgeae from a private grower that needed more room. It seems that this species doesn't tolerate as low of temperatures as other highlanders. I would venture to guess that it does real well in slightly warmer conditions as an intermediate. I've heard from some other growers having success growing N. burbidgeae in areas of Florida as a lowlander but I don't know if that is entirely true. One grower in Japan posted a photo of his 20 year old plant in one of the Nepenthes forums that was phenomenal. Larger plants are being offered from Borneo Exotics at relatively modest prices considering how long it takes to get this species to adult size.